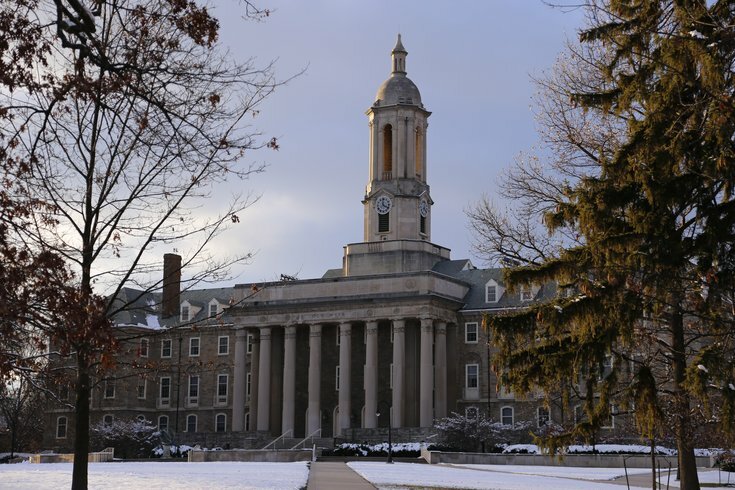 This is Old Main on the Penn State University campus Friday, Nov. 28, 2014, in State College, Pa.
A grand jury investigation into the cause of the 2014 suicide of Penn State student and fraternity member Marquise Braham found hazing was not a direct correlation, CBS Philadelphia reports. Braham was an 18-year-old student at the school’s Altoona campus when he committed suicide in March 2014 by jumping from a building in Uniondale, New York. Soon after his death, the Pennsylvania Attorney General began investigating the incident amid allegations that the Phi Sigma Kappa fraternity hazing, which Braham was a part of, led him to commit suicide. The investigation included interviews with several of Braham’s former fraternity brothers as well as an examination of at least two suicide notes that pointed to past suicide thoughts. According to CBS Philly, the jury found no evidence that hazing led to Braham’s death, although the jury did point out that hazing within the fraternity was “extremely dangerous and put the health and safety of all pledges at risk." Some of the activities, according to CBS Philly, included locking individuals in closets, excessive drinking and vomiting, sleep deprivation and forced fighting.